Includes one Milk Chocolate Truffle Egg, one Dark Chocolate Truffle Egg, and a Milk Chocolate Coconut Truffle Egg. 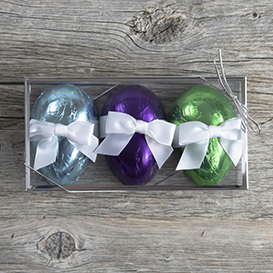 This trio of smooth, creamy, handcrafted Truffle Eggs is sure to brighten up your Easter basket. Milk Chocolate Truffle Egg: Milk Chocolate (Sugar, Cocoa Butter, Whole Milk Powder, Cocoa Mass, Lactose, Skim Milk Powder, Barley Malt Extract, Soy Lecithin, Vanilla), Cream, Dark Chocolate (Cocoa Mass, Sugar, Cocoa Butter, Soy Lecithin, Vanilla), Dextrose, Invert Sugar. Dark Chocolate Truffle Egg: Dark Chocolate (Cocoa Mass, Sugar, Cocoa Butter, Soy Lecithin, Vanilla), Cream, Dextrose, Invert Sugar. Milk Chocolate Coconut Truffle Egg: White Chocolate (Sugar, Cocoa Butter, Milk Powder, Soy Lecithin, Vanilla), Butter, Dried Coconut, Milk Chocolate (Sugar, Cocoa Butter, Whole Milk Powder, Cocoa Mass, Lactose, Skim Milk Powder, Barley Malt Extract, Soy Lecithin, Vanilla).